I played in a band with John Wildsmith from 2011 to sometime in 2016. We were part of a four piece classic indie-rock band called Levity Ball. John played guitar, and wrote and sang approximately half of our catalog of songs. He was always really fun to collaborate with because he would come up with such a wide range of lyrics and having two songwriters gave us a really unique sound. John could write some beautiful words and melodies that would cut you to the core but he also really liked to throw in a few lines that made no sense. He kept us on our toes. He’s also an all around lovely human being. He works with adults that live on their own but need a little help with their day to day tasks like cooking or banking, etc. Every year near the end of summer the organization he works for would have a retreat for their clients and Levity Ball would often get to play. I think all four of us would agree it was one of the shows we looked forward to playing the most. John is originally from England, and although he moved around a fair bit when he was young, he is now happy to call Vancouver his permanent home. 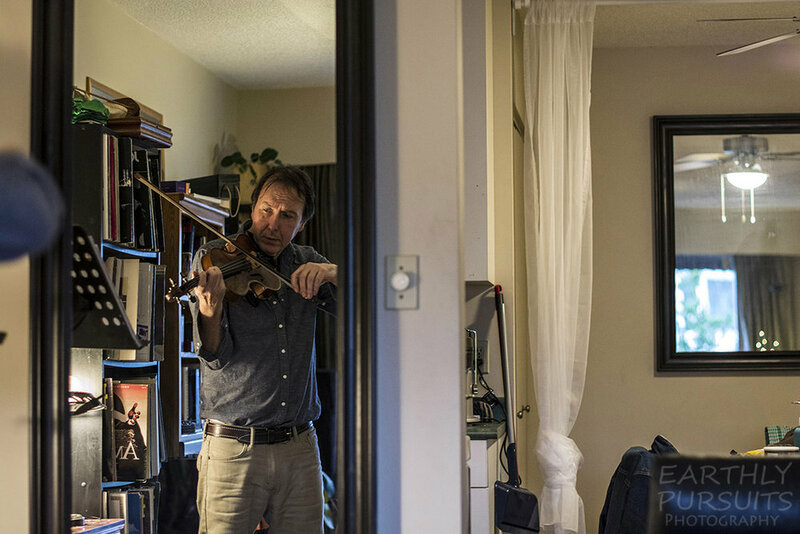 He still plays guitar, but his new love is the violin and for a few years now he has been taking lessons and working his way through the different levels of classical violin training. He was gracious enough to let me photograph him practicing one day last spring. I can trace my interest in music to when I was about 5 yrs old. The Beatles were on the radio a lot back then. It would have been 1966. I remember standing on a crate in the backyard and pretending to be a Beatle. My brother was learning the guitar (I still have it) but he gave up and it was passed to me. At about 8 I discovered chords and would strum away for hours experimenting with rhythms. Not sure what inspires me to play but I think it's all about expressing feelings. It amazes me how well music expresses emotion. To hear how I'm feeling while I play has always been a great source of comfort for me. I'm inspired by how beautiful and powerful music can be and yet we can't see it. We used to play a Beck song in Levity Ball called “The Golden Age” and it had the following lines. I loved those lines. It seemed to express how I was feeling at the time.. and I still feel that way sometimes which is one reason i love getting on the motorbike and just riding - i seem to forget all sad feelings and feel exhilarated instead. That's what I really love about certain songs. They can express and put into words and beautiful music what were feeling. With “The Golden Age”, Beck did all the work, all I had to do was sing it. It sort of affirms the existence of the human soul for me, just because you can't see it doesn't mean it's not there. What are you hoping to share or show the world through music? I don’t really feel like I need or want to convey anything. What I do enjoy though is playing with other musicians. Its sort of wonderful that a group of people can throw about feelings and play with them. It's a great question and I'd be interested to know what other musicians think. If you are interested in checking out John’s solo guitar music he has two Cd’s available via CD Baby.